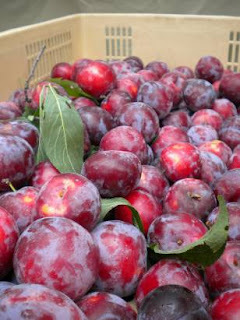 Peaches (mom0 in Japanese), prunes (a dusky hued plum), and plums (sumomo) sat fat and sassy in their crates just waiting to be scooped up. Last year they would have inspired visions of jam in my head, but this year my brain is turning to shu. (No intended double meaning intended there.) Energy concerns, summer's ridiculously high temperatures, and a lack of time as the semester ended with writing deadlines and packing for Hokkaido to be done, shu seemed a logical choice. 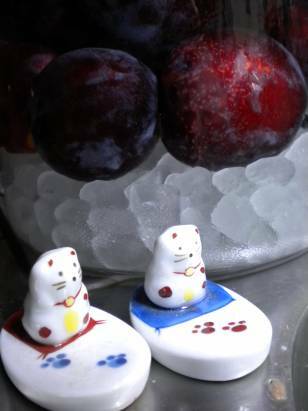 Sumomo or Prunus triflora, are a species of plum found in Asia and usually smaller than their American cousins. A little research tells me the half-ripe plums are usually turned into shu, which would be in keeping with what I know about ume, too. The ones I purchased at the market were quite fat, more in keeping with the American varieties I know, and terrifically sweet and ripe. In American Gardening (1891, A.T. De La Marre Printing and Publishing), there is a hint about making a vinegar as well, which sounds intriguing. For now, I'm sticking with simple shu. Soak the plums for a few hours in order to soften the stems for removal. Meanwhile, give the jar (a four liter one in my case) a good scrub and dousing with a freshly boiled kettle of water. Dip each plum in the liquor as a sort of quick disinfectant, and place in the jar immediately. Plop in the sugar and pour on the liquor. Cap and tuck away until winter. Try to remember to give it a good shake every so often to help ensure mixing of the ingredients, and to check out how things are progressing. In hindsight, I do wish I'd tossed in a few star anise and a cinnamon stick or two. My hunch is that these would make a lovely flavor with the plums. Ever tried something like that? I'd love to hear more.